The networking business just got a wake-up call from server virtualizer VMware in the guise of a $1.26bn acquisition of virty networker Nicira. VMware's CTO Steve Herrod has been talking up the concept of the "software-defined data center" for the past couple of months, and the server virtualization juggernaut and cloud wannabe just proved it is deadly serious about dominating the future data center by forking over a hefty chunk o' change to acquire Nicira. That company is backed by a bunch of prominent VCs and is a leader in virtual networking, and had VMware not acquired it, Cisco Systems, Citrix Systems, or Microsoft might have done so and transformed themselves into a real threat to VMware. VMware has used a bunch of names for the concept over the years – it was initially called the virtual data center operating system, and then the 21st century software mainframe – but the idea that is driving the expensive Nicira acquisition is the same: VMware wants to virtualize servers, storage, and all layers of the network and control it programmatically with out-of-band management. VMware arguably has the most sophisticated server virtualization stack around, and certainly for x86 machinery, and includes its vSwitch virtual switch to glue hypervisors together plus VXLAN overlays in its vSphere stack of server virtualization to allow VLANs to map to each other. And with parent EMC as well within its own development efforts, it has integrations into virtualized storage arrays as well as file systems. But the weak spot – and indeed the weak spot that all server virtualization tool makers have – is virtualizing the network. Nicira, which has been operating in pseudo-stealth mode, is the largest acquisition that VMware has ever taken down, and will very likely have the highest premium that VMware will ever pay for any company it will ever buy. The price is especially high considering that Nicira only has a couple dozen customers, according to Alan Cohen, vice president of marketing, who coincidentally talked with El Reg about software defined networks prior to the VMware acquisition. Rackspace Hosting is the big customer that Nicira talks about a lot, but the newly acquired company has also sold commercial implementations of its Open vSwitch virtual switch for hypervisors and Network Virtualization Platform (NVP) controller, an out-of-band virtual network control freak that implements OpenFlow protocols, among other jobs. Nicira was founded in 2007 by Martin Casado, a researcher at Lawrence Livermore National Laboratory whose PhD thesis at Stanford University was the basis of the network virtualization tools developed by Nicira. Nick McKeown, a professor at Stanford who helped Cisco design its GSR 12000 router and worked at HP Labs among many other interesting work in the networking field, is also a Nicira co-founder. So is Scott Shenker, a professor at the University of California at Berkeley who did a stint at Xerox PARC and who has done consulting gigs with AT&T and Cisco as well. In fact, McKeown and Shenker were Casado's PhD advisors. Steve Mullaney was brought in as Nicira CEO in 2009. The company launched its first commercial NVP controller and sort of came out of stealth in February 2011, and started shipping the NVP code last July. But Cohen tells El Reg that the company had a big product rollout scheduled for this fall to "really showcase" what network virtualization can be. The important thing about what Nicira has done is that its network virtualization wares run atop existing network infrastructure, making it more malleable, without requiring customers to change their switching infrastructure. In addition to the Open vSwitch virtual switch, which is used by Citrix Systems in its XenServer commercial-grade hypervisor, Nicira is also the commercial entity behind the Quantum network abstraction layer in the OpenStack cloud controller, which will go commercial grade with the "Folsom" release of the OpenStack code at the end of September, if all goes well. If you are not aware of the hype surrounding software-defined networking, you might be wondering why VMware shelled out so much money for Nicira, a company that likely has very little revenues. Outgoing VMware CEO Paul Maritz said on a call with Wall Street analysts going over the deal and VMware's Q2 financial results that the acquisition would not have a material impact on sales in 2012. "This acquisition was made for its strategic value, not its revenue value," explained Maritz, saying that VMware was able to build such a large and profitable business because it got out on the front end of server virtualization early and kept innovating. "We believe, given the price tag, this is of the utmost strategic importance," he said. "Being an early leader in this space is incredibly important and we believe that it will pay off, just as it did with server virtualization." The big payoff will initially go to Andreessen Horowitz, Lightspeed Venture Partners, and New Enterprise Associates, who kicked in $50m in Series B and C funding. Interestingly, Diane Greene, the co-founder and former CEO of VMware who was ousted by EMC and replaced by Maritz four years ago, is an angel investor in Nicira, as is Andy Rachleff, who used to be a general partner at Benchmark Capital. Under the terms of the deal, VMware will pay $1.05bn to acquire Nicira, and it will also assume approximately $210m in unvested equity awards to Nicira shareholders. The boards of both companies have approved the deal, which they think will close before the end of the year. Like VMware, Nicira has a mixed bag of open and closed software, and this is not going to change. "We're very committed to both Open vSwitch and Quantum," Bogomil Balkansky, senior vice president of product marketing for virtualization and cloud platforms at VMware, tells El Reg. And while VMware has not completed the deal and the two companies have not come up with product roadmaps, he agrees that a likely thing to do is to bring Open vSwitch inside of the ESXi hypervisor as an alternative to the vSwitch switch created by VMware itself for the vSphere stack to virtualize network connections between virtual machines. At the moment, Nicira supports a version of Open vSwitch inside of an ESXi virtual machine, which runs as a software appliance. 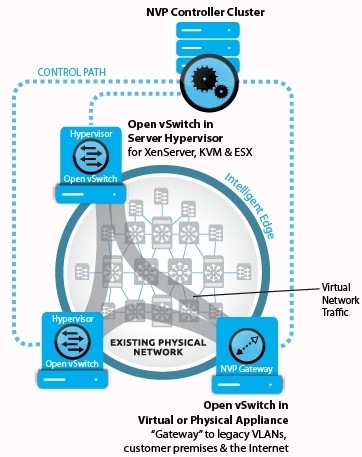 Open vSwitch is being upstreamed into Microsoft's Hyper-V hypervisor, according to Cohen, and it runs natively with the Linux kernel (and thus the KVM hypervisor), and also natively with XenServer, thanks to the integration that Nicira and Citrix have done. So putting Open vSwitch inside of ESXi would at the very least bring it on par with or ahead of hypervisor alternatives. The NVP controller will talk to any virtual switch, of course, but tight integration means better performance. Another possible early integration will be to take some of the vShield security software, which runs in Layers 4 through 7 in the network stack to protect virtual machines running atop the ESXi hypervisor, and port them over to the NVP controller from Nicira.